Do you know that you can now create three-dimensional objects with the use of 3d printing pens? This latest technology is not only popular among artists but also on kids, hobbyists as well as other people who are trying to expose their creativity. 3d printing pens basically resemble a typical pen or pencil. The only difference is it does not have an ink or lead since it utilizes plastic. Basically, it works like a glue gun. As of the moment, 3D printing pens are using two kinds of technologies. The first one is FDM which means “Fused Deposition Modeling”. This is actually the same technology that is being used in most desktop 3D printers. It works by inserting a plastic filament into the pen. The plastic is then melted inside the pen so that it will come out as a liquid. The second one uses a unique ink known as “photopolymer” which get hardened once it is exposed to ultraviolet light. The liquid ink will be expelled through the nozzle where it is treated by LED nodes. Although this process is not quite popular this is safer for kids since the nozzle remains cold. The most amazing thing about 3D printing pens is that it can be used on almost all surfaces. Primarily, 3D printing pens are very easy to use, however, there are some which are more versatile and convenient to use. The best 3D pen lets you choose the plastic filament to use, the temperature of melting this filament as well as the speed of extracting it from the pen. Don’t choose 3D pens which are thick and huge since you will be having a hard time grasping it. Some models will jam up quickly while others feature impressive unclogging mechanisms. There are even others which consist of LCD screens where you can view the temperature and speed settings. This latest technology might be relatively new, yet we’re on top of it. We’ve managed to collect some of the top players in the market to give you a list of the 10 best 3D printing pens. So, which is the best 3D pen for you? It actually depends on what you want to create. There are different varieties of 3D printing pens, some are designed for kids while others are designed for artists and hobbyists. Examine each product carefully and look for the best features. 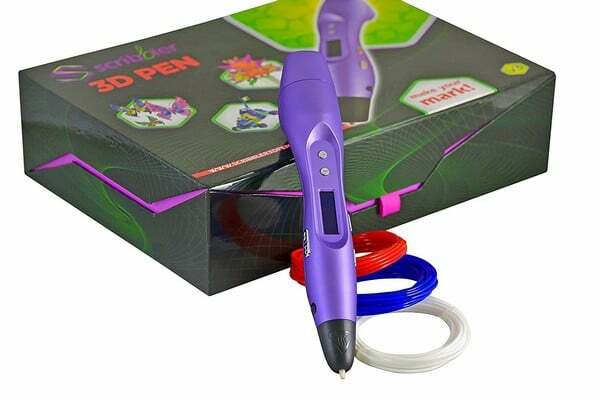 Scribbler 3D Pen has the ability to control discharge speed and temperature. You have the option to select the plastic filament. It is very light compared to its competitors. 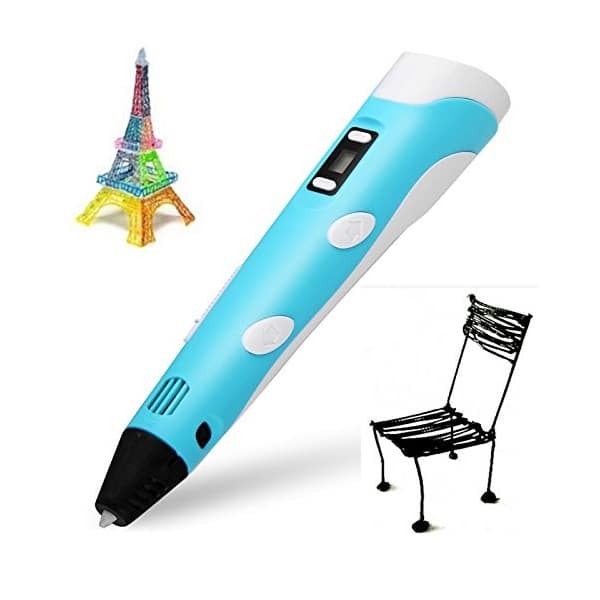 The Scribbler 3D Pen looks stylish and very comfortable, which is why it is not surprising that this is one of the highest rated product. The LED screen will show the pen’s temperature and speed. This pen requires 1.75 mm filament and its temperature settings are compatible with PLA and ABS. It can be used by anybody regardless of their ability since it has six-speed settings. The LED status display is broad. 7TECH 3D Printing Pen includes unclogging mechanisms which forbid jamming making it easy to maintain. This pen includes an LCD screen where you can view the temperature and speed settings. The controls and very easy to navigate. It is slender and operates quietly. According to users, this pen is very reliable. 7TECH 3D Printing Pens utilizes 1.75 mm filament and includes some ABS spools. Lightweight, sturdy, comfortable and easy to use. The auto standby will function when not used after 5 minutes. 3Doodler Create 3D Pen is the first 3D printing pen that is introduced in the market. It became the standard for this technology. The first generation was an instant hit, however, it has some issues. For instance, most often the plastic gets jammed inside the pen. It has problems with temperature and sometimes the discharge pauses. The second generation fixed most of its problems. It is now slender and has a continuous flow mode. Additionally, it has extra nozzles which can generate various sizes and shapes. With simple and easy to use controls. Includes a battery pack that can be used up to three hours. For a continuous flow, just double tap the feed button. The end tip is fragile and may get damaged when tightened. Temperature control problems on the first generation. Myguru 3D Stereoscopic Drawing Doodle Pen is one of the best 3D printing pens. It is slimmer and quieter compared to the first generation 3Doodler. This pen utilizes three small spools of 1.75mm ABS filament. You can choose between fast and slow discharge through its speed control. 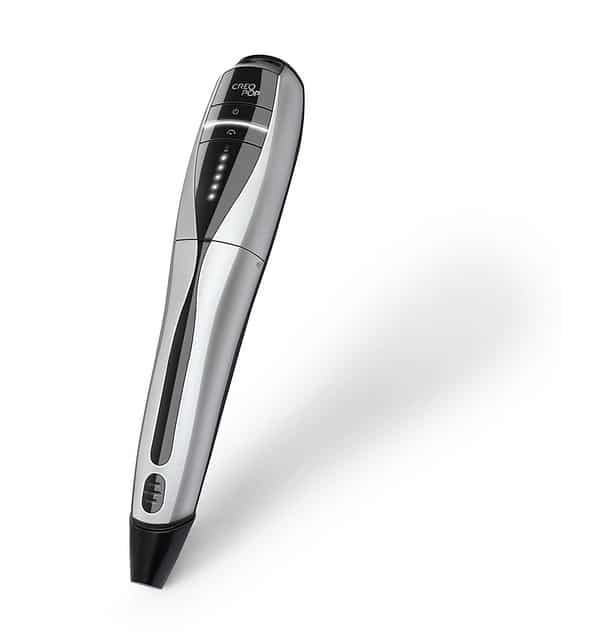 The Samto 3D printing pen also includes a temperature control. Automatically switches to standby mode when not being used for 5 minutes. It has an erratic performance. Sometimes it works excellently, sometimes not. With steep learning curve and insufficient instructions. MYNT3D Professional Printing 3D Pen provides you with everything you need. It can let you create amazing works of art and best of all you don’t have to spend too much. This pen can be customized according to your needs. It has controls for speed and temperature. The feed control can let you adjust the flow of the filament. You can increment the speed if you’re working on big areas. By double-clicking the bottom button, the pen will continuously expel the plastic. Includes A/C adapter and 3 colored plastic filaments. Works great on ABS and PLA filaments. The broad OLED display will show you the current settings. You need to buy some additional filaments. Soyan 3D Printing Pen can let you bring your imagination to life. Once the heated plastic is expelled from the pen it quickly hardens, letting you create real-life 3D works of art. It is slender, lightweight, and easier to handle. Regardless if you use it for a long time, it still feels comfortable in your hand. This pen can be used vertically or horizontally. It is perfect for all ages. Heats up in just 2-3 seconds. DEWANG Equipment 3D Printing Pen can let you enhance your artistic skills. It has an ergonomic design and comes with everything you need. This pen is very easy to control and maneuver, regardless if you have small or big hands. It is battery-operated but can still work with electric cable, so you can continue your work without any distractions. Just insert the filament into the port, wait for it to heat up then start bringing your creation to life. This pen is cordless and includes an electrical charging cable. Uses PLA filament, which is very affordable. Speed and temperature are fully adjustable. Switches and levers are placed in a convenient location. It is affordable and the exterior part is cool to touch. CreoPop Cordless 3D Printing Pen offers more durability, flexibility as well as versatility. It uses premium technology and features to boost your creativity. It is easy to maneuver since it has a cordless design. This 3D printing pen is battery-operated but you can still continue to work when the battery dies by using the electric cable. It has 5-speed settings so you can start at the lowest and work your way up. CreoPop 3D Printing Pen uses photopolymer ink so it does not consist of any harmful toxins. The LED light will brighten up your work area and hardens the ink instantly. There are various colors of ink cartridges that are available. It comes with 3 ink cartridges and an electric charging cable. Can be used on all age levels. The ink cartridge is a bit costly but it’s non-toxic. Are you looking for a 3D printing pen for school or just for fun? If so then AdroitOne V4 3D Printing Pen is the best option. Let your creations come to life. It comes with a USB port, so you can bring it anywhere. Just plug it into your laptop and insert some filament into the pen. The filament temperature is very easy to adjust. This pen uses a ceramic nozzle. The alphanumeric display is very clear. 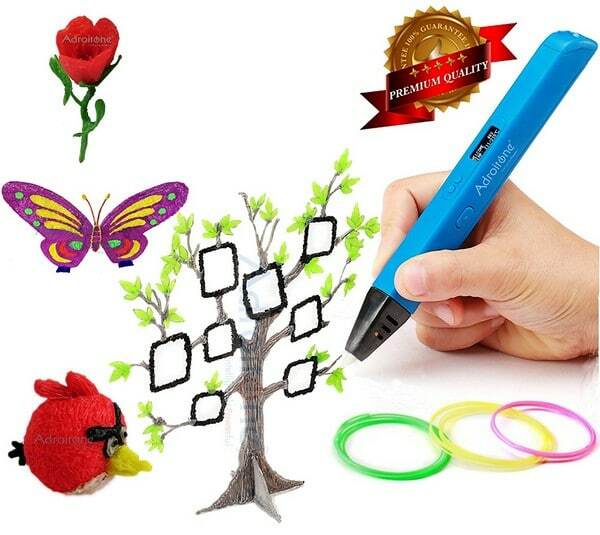 YaYa3D 3D Printing Doodle Pen can let you unleash your creativity. This pen permits you the chance to draw in different directions. Additionally, you can construct fragile object easily. It uses 0.7 mm copper nozzle to provide you the finest details. YaYa3D 3D Pen is truly a great value but it’s not made of the best quality. It has the ability to draw on paper as well as in any surface. Just inverse the button for any unmelted filament. Safe and precise due to its instant cool technology. Once charged, you can already use it but not for a long period of time. If it’s your first time to see a 3D printing pen then you’ll probably get stunned. Obviously, this is just a natural reaction. This pen is large and bulky, some include a power cord while others are cordless. You’d probably ask yourself, how in the world is this going to work? Once you’ve learned how to use it then it will just be a natural thing to you. After purchasing a 3D pen, the first thing to do is to plug in the power cord. This will power up its internal heating mechanism. Wait for a few seconds then insert the filament into the top of the pen. The pen also includes speed adjustment so you can control the filament being expelled from the tip. Place the tip of the pen on the surface where you want to draw your object. The plastic will continue to flow from the pen until such time that you are going to halt it. Kids prefer to use 3D printing pens instead of their crayons since it is fun and you can let your imagination run wild. However, these are not only meant for kids alone but also for adults. They are the best tool for creating 3D modeling and conceptual thinking. They are also great for artistic purposes, decorations and repairs. 3D printing pens require patience and a steady hand, so don’t get discouraged easily if it gets messy. A printer or a 3D pen, which is the best? A printer is rigorous and accurate, making it perfect for making prototypes. However, a 3D pen is more creative. A printer needs a complete 3D model file while a 3D pen can let you create any shape using your own imagination. If you’re already getting bored of using your android app for drawing objects then why not try this latest technology. New models will be launched during the CES 2019, so watch out for it!